Thank you so much to everyone who participated in the #NutriciaMetabolics #Pushups4PKU challenge, which ended on National PKU Awareness Day, December 3rd, 2016. Nutricia North America is proud to have been a part of a movement to help raise awareness of PKU and raise funds to support NPKUA and CanPKU. The outpouring of support from the community has been amazing! There are so many wonderful videos from families, school classes, sports teams, colleagues, fitness classes, kindergarten classes, metabolic clinics, healthcare professionals and friends that have truly touched us. 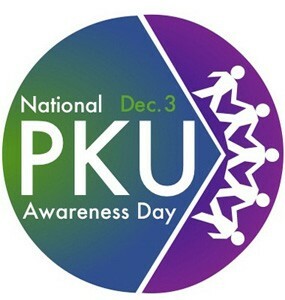 We thank everyone who took part and shared their dedication and support for those affected by PKU. We couldn’t have done without your support. We are pleased to be able to donate this shared amount of $3,000 in total to NPKUA and CanPKU. Thank you to all for your push-ups in support of PKU. Nutricia North America is once again proud to support the National PKU Alliance (NPKUA) and Canadian PKU and Allied Disorders Inc. (CanPKU) by sponsoring the annual Push-Ups for PKU Challenge to help raise PKU awareness and money for PKU research. 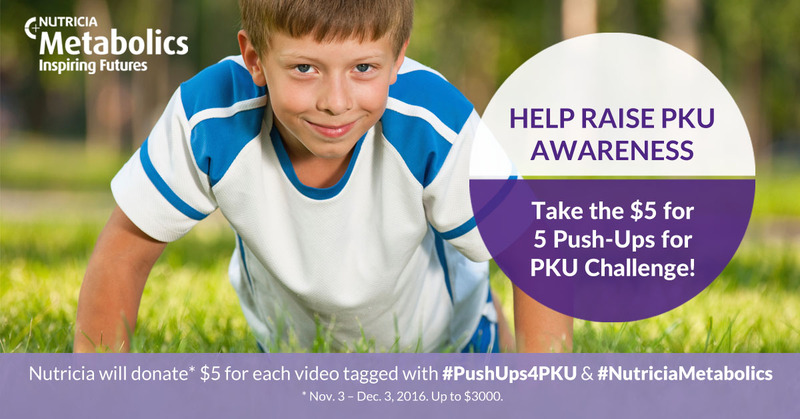 From November 3rd through National PKU Awareness Day on December 3rd, 2016, Nutricia North America will donate $5 for each video of a person or group of people doing at least 5 push-ups in support for PKU. Get involved and challenge your friends to help spread the message of PKU Awareness! You can also post it directly to Nutricia’s Facebook or Instagram accounts. Anyone can do it! You can do the push-ups on your knees, on your toes, or even against a wall. You can even lift a can of formula in the air 5 times or get creative otherwise. So don’t delay, do your push-ups today! Nutricia does not assume and it hereby expressly disclaims any and all liability to any person or entity for any claims, damages, liability or other loss in connection with this contest. In no event shall Nutricia be liable to any person or entity for any direct, special, exemplary, indirect, incidental, consequential or punitive damages of any kind or nature whatsoever (including, without limitation, any liability for injury or other damage related in any way to participation in this contest directly or indirectly) whether in an action based on contract, warranty, strict liability, tort (including, without limitation, negligence) or otherwise, even if Nutricia has been informed in advance of the possibility of such damages or such damages could have been reasonably foreseen by Nutricia. Nutricia will cap the donation to a maximum of 600 videos during this time period or up to $3000.